The United States has pursued a self-defeating client king strategy in the greater Middle East. It failed in Iran in 1979 and it has failed now in Egypt. It has failed because the global spirit of the age has changed, and America has not yet changed with it. This is an issue of practical strategy and not an idealistic hope. We need to get with the global program or risk an historic loss of authority on which our entire world position depends. To understand what has happened we need to compare our approach to Egypt to what long-ago Victorian Britons did. The British regime in Egypt lasted 70 years (1882-1952). A strong Consul-General ran the government. Paper Egyptian front men held the titles, while the ministries themselves were run by British officials. Solid Victorian rule-of-law rooted out corruption. In the "Veiled Protectorate" the British set about "building capacity." A mutinous army was disbanded and a very modern model created, complete with pips and collar tabs. Finance was reformed, and a program of development and internal investment vigorously pursued. Furthermore when Egyptians grew restive the British balked in fairly short order, abolishing the protectorate and establishing an independent Kingdom of Egypt. The mass demonstrations in April and May of 1919 in fact look eerily like the protests of the past few weeks, almost as if recent video feed represents DNA-encoded democratic political expression, Egyptian-style. Compare Britain's three generations in Egypt to our one. No colonial protectorate for us, no proconsular eminence grise. No, Mubarak was our "friend and ally in the region." No American military forces "in-country," and lots of guaranteed good U.S. aid, averaging $2 billion per year since 1979. But almost all the "aid" went into the pockets of Mubarak's crony-elite, and especially his armed forces. Where real wages doubled under Nasser (1960-1970), income growth for working Egyptians has been frozen since. Moreover the state under Mubarak has been vicious in its suppression of political dissent: It is a regime that rules by torture. Such is their professional attainment in this delicate art that the U.S. has rendered many, many "detainees" to Egypt for treatment. A European Parliament report cited over 1,200 CIA flights using European airspace between 2001 and 2005. So where does this leave us? Strict comparison would incline to prefer the British colonial to America's client king model. But how can this be? European colonialism represented a truly repugnant, even loathsome paradigm of subjugation rationalized through racism. So how do we confront the truth that British rule in Egypt led to a far more positive and civilized outcome than the despotic parasitism nurtured by the U.S. "alliance relationship?" Perhaps we should flip the question. The answer does not imply that we should go backwards, it is rather to suggest that the United States government has deliberately and in full possession of its senses pursued a longstanding relationship with another state that created, even institutionalized, political tyranny, torture, and corruption on a national scale. We have not simply been complicit. We have not simply looked the other way. We did not simply "enable." We created. But our experience in Egypt has deep roots. Our veiled American alternative to visible colonialism has been with us for a long, long time. As lovers of liberty we cavil at the thought of outright occupation and administration, so we have come to prefer cozy clientelism -- even if the result is uncontrollably vicious and corrupt. While Lord Cromer was working enlightened Victorian magic on Egypt, Americans were conquering a very large and very rich Caribbean island. But the U.S. chose not to occupy and administer Cuba after 1901. Instead we nurtured a client republic, seeking out military men who would do our bidding for nearly 60 years. 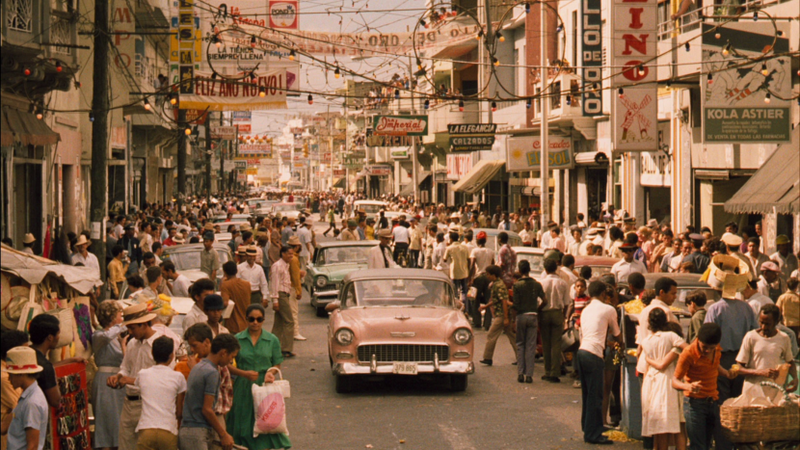 The fabulous corruption of the Batista regime -- put in power by a US-engineered coup -- has even passed into cinematic lore, for those who have seen Godfather II. Truth is we are inured to client king imperial management. It has been an American norm for so long we no longer even feel a twinge. It is a bipartisan handclasp in the halls of Congress. Hence Charles Krauthammer confides that the Egyptian military should "guide" the nation, while Richard Cohen avers, "a democratic Egypt... is not in our interests." Of course they applaud the impossible prospect of a democratic republic, impossible because it must have no Islamists. However delicately parsed their words, the Washington establishment prefers military guardianship for Egypt. Back to the future. Yet what is so wrong with looking out for our own interests, even at the expense of the welfare and liberty of whole peoples? The answer to this question need not be "idealistic." In fact it is today's establishment "realists" who are living in a backward-looking world of idealized fantasy. Idealism is the new realism, and here is why. We live in a world now of globalized consciousness -- and the consciousness of humanity is changing before our eyes. Today's spirit of the age is more about people than ever before, and the feeling against tyrants is greater that at any time in history. You, world power -- however big and awe-inspiring you are -- cannot buck the spirit of the age. Consider the British in Egypt just for another moment. When the Victorian Force was with them they were unstoppable. In the 1880s it was not only possible to argue that Britain was a global civilizing force, everyone would agree and urge you on. In 1919, after betraying this spirit in a war that nearly destroyed civilization, world consciousness shifted. Woodrow Wilson's 14 Points contained these electric words: "Political independence." 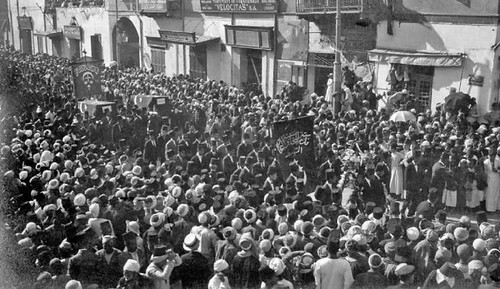 Mass demonstration of the Egyptian people -- in 1919 like today -- was a sign that the world zeitgeist had shifted forever. It shifted again at the end of World War II. But this time the British were strangely out of touch. When Nasser nationalized the Suez Canal in 1956 the British led an invasion of Egypt. But this was 1882 no longer. Ironically, the U.S. stayed the British-French-Israeli neocolonial enterprise, but then undertook an enterprise of its own, for much the same reasons. The Bay of Pigs in 1962 accorded us the same humiliation bestowed on Britain over Suez. Today the spirit of the age has shifted yet again, moving yet further away from memories of a Victorian imperial age. With every autocrat the U.S. enables, we create, not "stability," but rather the seeds of democratic enmity against America. Moreover everyone in this humanity can see what is happening and what we do. That may rankle with a Washington establishment that seeks to make transparency a crime, but it is too late. It is too late to hide inconvenient truths. It is too late to control others for our own self-interest. To persevere in our stately course of client kingship is to go over, inevitably, to the dark side -- and in history's course, this must also be the losing side.